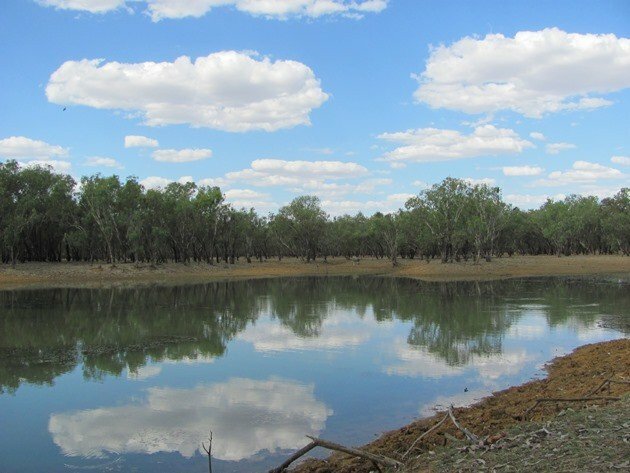 Last month when we were away from home camping in the Kimberley region to the north of Broome we pulled up at a dam close to the road that was the only water for many miles around. 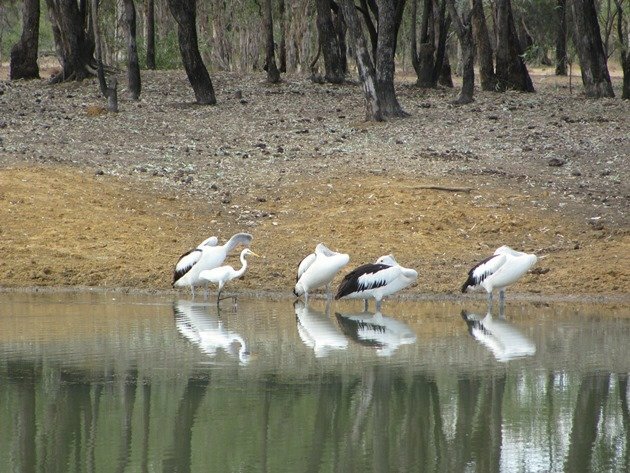 There is a rest area at Ellendale, which is 145 kilometres (90 miles) east of the Willare Roadhouse and 87 kilometres (54 miles) west of the closest town of Fitzroy Crossing. The rest area consists of shade, some picnic tables, fire places and composting toilets and is popular with travellers during the cooler months. By September the number of travellers on the roads in the north has greatly diminished and also the fresh water supply at water holes and ephemeral lakes has greatly diminished. A dam on a station can be the only water supply for many birds and animals and is always worth stopping and checking out. 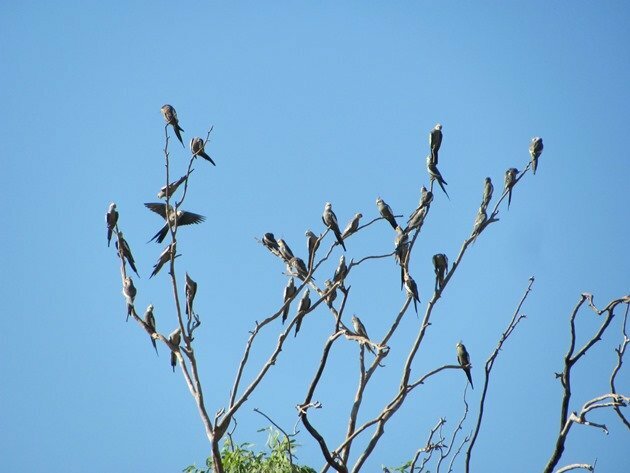 It was over 41c (106f) when we pulled over at the dam close to the highway a few kilometres west of the rest area and it was indeed a popular spot for birds. 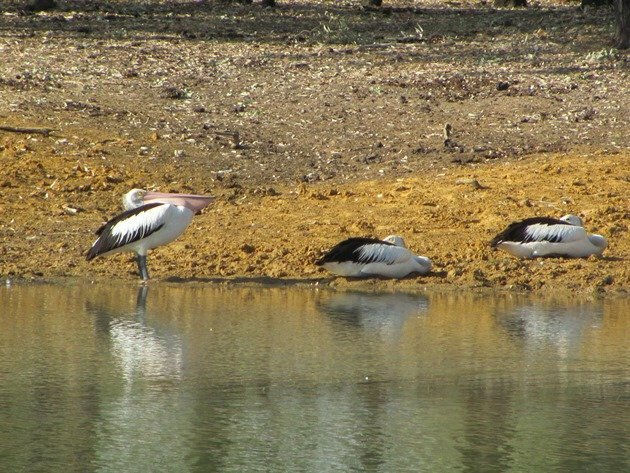 We were surprised to find four Australian Pelicans in what appeared to be the middle of nowhere, but they appeared to be able to feed in the dam and relax on the muddy edges. There were also three Little Black Cormorants that had stopped at this remote location and one Great Egret. Although you would not think there would be many species in this area the water was a large draw-card and there were odd individual birds that had dropped by. 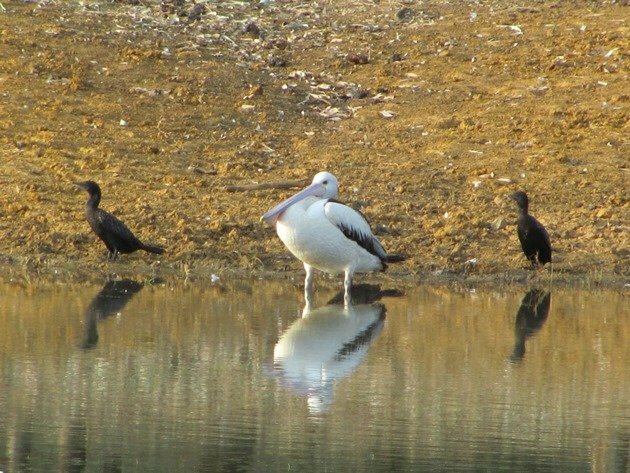 These included a Straw-necked Ibis, White-necked Heron, Royal Spoonbill, Australasian Darter, Australasian Grebe, Wood Sandpiper and a pair of Masked Lapwings. The trees were full of a variety of birds and there were Rufous-throated Honeyeaters, Banded Honeyeaters, Yellow-throated Miners, Yellow-tinted Honeyeaters, Brown Honeyeaters, Olive-backed Orioles and the largest number of Little Friarbirds that we had ever encountered. 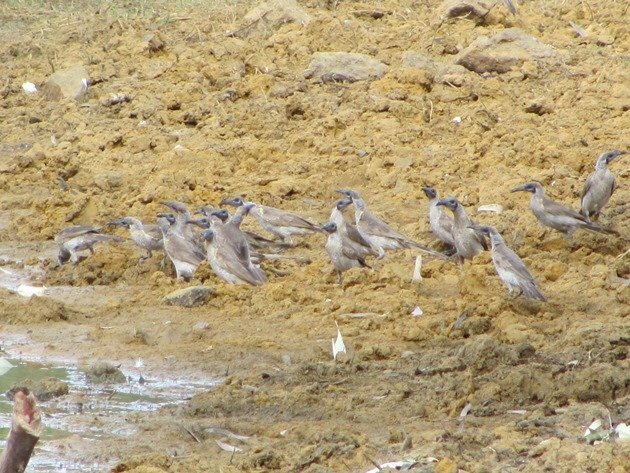 There were over 250 Little Friarbirds and many of them still had juvenile plumage and would all come down to the water together to drink. 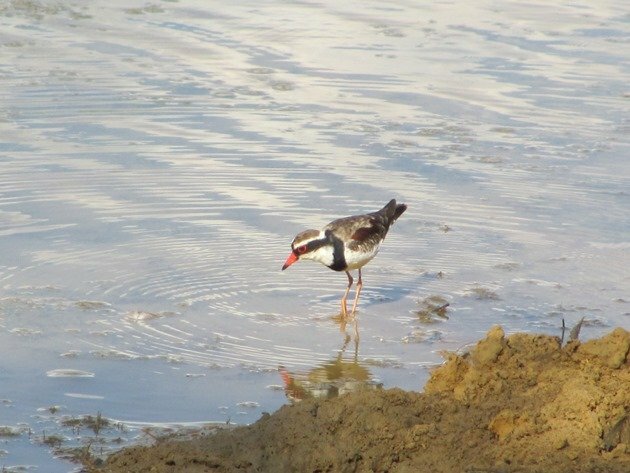 Pacific Black Ducks and Hard Heads were present on the dam and one lone Black-fronted Dotterel fed along the edges where we had pulled up in the shade. 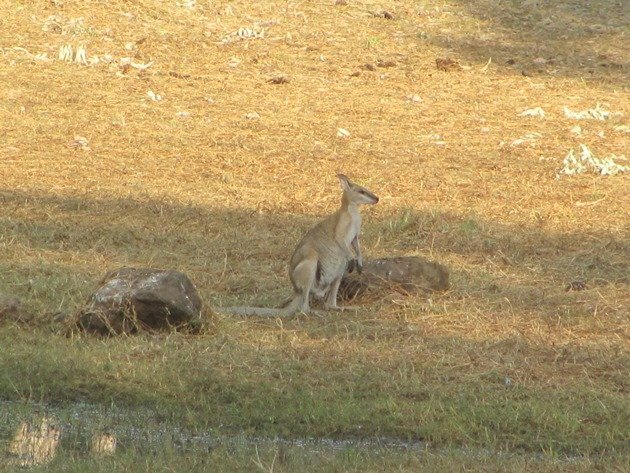 As the day wore on and it got cooler there were Agile Wallabies coming down to drink and then large flocks of Little Corellas filled the sky. 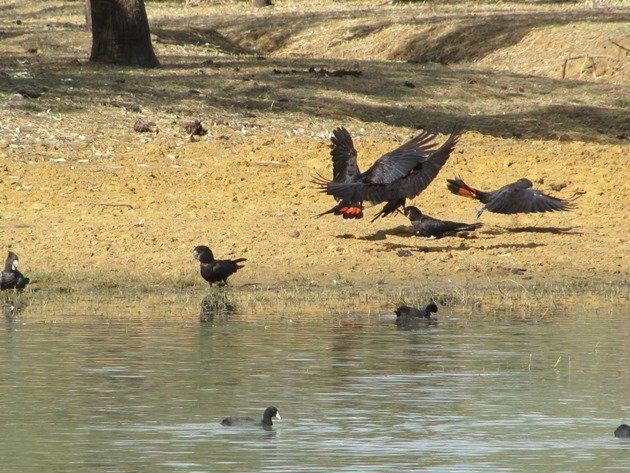 They were soon accompanied by Red-tailed Black Cockatoos and Galahs, which also came down to the water’s edge. It wasn’t long before there were huge flocks of Cockatiels arriving in the nearby trees and after some hesitation they also came down to drink. Cockatiels drink very briefly and almost in flight and then straight back to the surrounding trees. 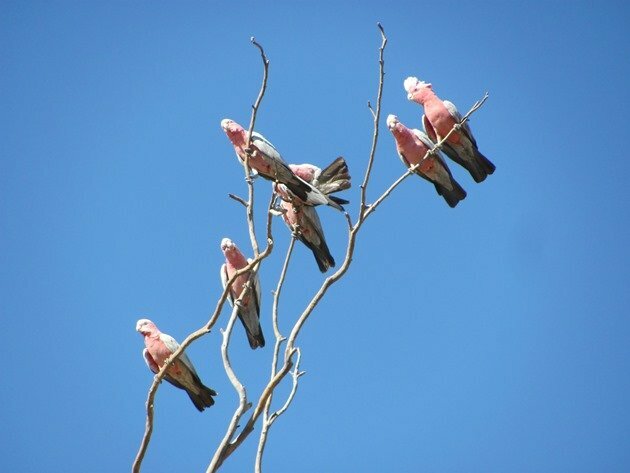 Budgerigars flew overhead, observed the water and dropped by too. The next surprise was a flock of over 100 Varied Lorikeets, which perched in a nearby tree and then swooped down over the water to drink. 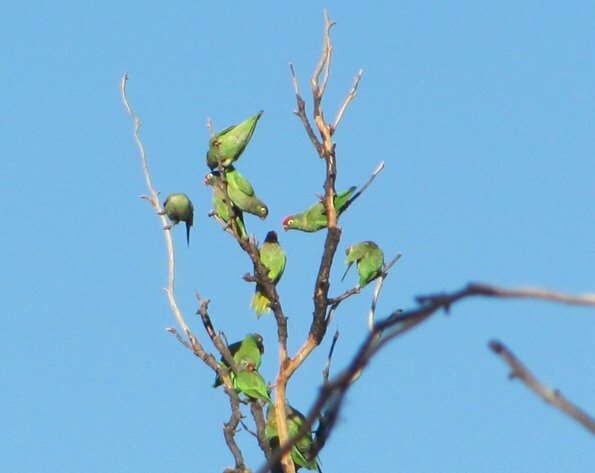 Until this past fortnight Varied Lorikeets did not come into the township of Broome very often, but much to everyone’s delight they have been moving in. The Varied Lorikeets are looking for food and water and that is a good indication that there is a lack of it beyond the town. 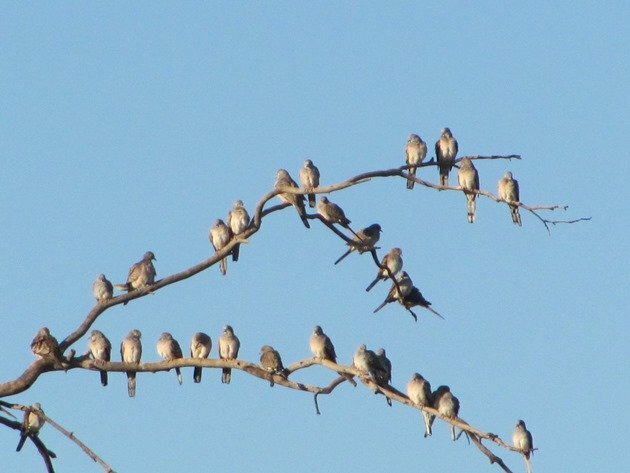 Hundreds of Peaceful Doves and Diamond Doves flew into the surrounding trees and then came down to the water to drink and Magpie-larks were busy feeding along the edge too. Crested Pigeons wandered in from the surrounding bush and Torresian Crows called out from the nearby trees. We were surprised to only observe Zebra Finch and no other finch at this location that day. Other species that we observed at the dam were Great Bowerbird, White-winged Triller, Fairy Martins, Black-faced Cuckoo-shrikes, Willie Wagtail, Paperbark Flycatcher, Whistling Kite, Brown Falcon, Blue-winged Kookaburra, Tawny Frogmouth, Pied Butcherbird, White-breasted Woodswallow and Brown Goshawk. It only goes to show that a muddy dam beside the highway may not look that appealing to you, but it is definitely worth stopping at to see what birds are about. This is especially true on hot dry days in September! What a hotspot for birds! 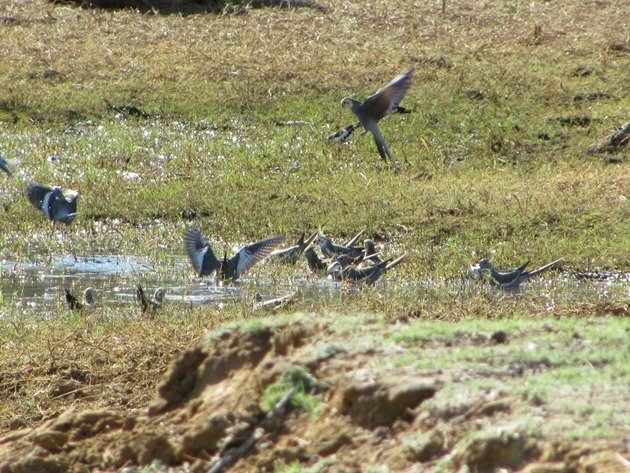 Yes, it was and even the smallest amount of water can support a huge number of birds and animals on a dry continent. All of these are truly stunning birds! The Red-tailed Black Cockatoos are just beautiful. When I was in Australia, I saw only one– dead by the side of the road. You were so lucky to find healthy, live birds. What an amazing place you discovered! 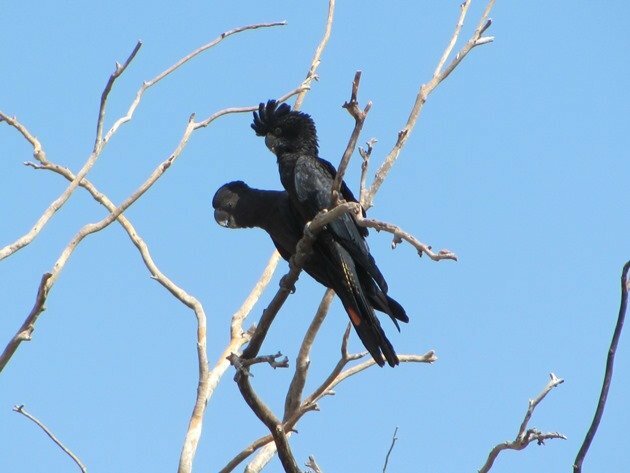 I hope you get to see lots of healthy, live Red-tailed Black Cockatoo one day in the wild! I’m with Wendy, Red-tailed Black Cuckatoos look amazing! And I really, really like the sound of the word “Ellendale”. I’d probably go there – given the chance – to see if the place meets the expectations created by the name. Apparently, it does!